Asha nervously waits for Sona outside house. Bejoy says Sona will return, this is not the first time she is coming home late. She says nothing is good. Bejoy says she thinks he did wrong by send Dev to Sona’s office. He is just safeguarding his daughter from Dixits. Asha says he is the big problem in Sona’s life. He says whatever she says, once Dev gets married, Sona will also move on. Asha says it is waste talking to him. Bejoy walks away. Asha asks where is he going now. He reminds she told she will not talk. with GKB. GKB tries to forcefully feed sweets to Asha. Asha says no. Vicky insists. Ishwari enters and asks GKB why she is forcing Asha. Vicky says maa is trying to spread happiness. Ishwari says Asha came to meet her and she will serve her. She takes Asha to her room leaving GKB and Vicky fuming. She then cries that she wanted Dev and Sona to unite, but her plan failed. Asha says as Bejoy says god does not want to them to unite. Ishwari asks not to say that, she still has hope. Soha enters with Golu and says papa is doing all this to make mamma realize how much she loves papa and he himself told her. Ishwari and Asha get happy. Dev peeping from window into Sona’s office thinks tomorrow is his engagement and Sona is working in her office, it is time to make re realize. He calls Sona and asks if she is coming. She says she is resting. He says she has a lot of work tomorrow. She says let her rest and tries to throw phone. Bejoy enters. Dev thinks why this old man came here. Bejoy asks if she has a lot of workload at office. Sona asks him to sit. Bejoy says he came here to explain her that Dev’s marriage is a good thing so that she can move on in life. He knows it is different for sometime,, but she will feel fine after that. She apologize for getting angry at home. He says that is okay. Dev thinks old man is giving wrong advice to Sona. Bejoy hears window sound says there is a rat here. Dev hides. Sona says nobody is here except them. Bejoy continues. Sona asks him to go home. Bejoy leaves. Sona falls asleep on her chair. Dev enters and sits on desk looking at her. He says since she came to Delhi, he wanted to tell her something, but did not get a chance, now can tell it. She did wrong by cropping her hair, long hair used to look good, but truth his short hair also suit her. Even stupid spectacles, she looks good in everything. He does not like the fear on her face and he knows it is because of her, why don’t she think of herself even though she had Suhana with her, at least now she should realize how much she loves him and stop his engagement. He says miss Sonakhi Bose I love you the way I loved years ago and nothing has changed for him. He leaves. Sona continues sleeping. Dev reaches home sadly. Ishwari enters his room and asks if he had gone to meet Sonakshi. Dev nervously stammers no, why will he. Ishwari says their destiny is same, Sonakashi. She talked about his marriage because…Dev says he took if forward. Sona has to realize her love for him, till then they have to wait. Ishwari says why she is not understanding her love for Dev. Dev says may be because she is hurt, maybe because of her. Ishwari says she told her that she is her culprit and apologized. Dev asks if she told that she considers her as bahu still, Sona is a ver smart girl and understands well. She thinks he plays with lives, he is doing same. Ishwari says if he gets engaged, Sona’s heart will break. Dev says even his and Nisha. Ishwari says even Soha’s, Asha and her heart. Dev says she is his mother and he will obey her, but why will Sona obey her, what is she for her. He selected Sona 8 years ago and Ishwari also likes her now. Sona came here as nutritionist 8 years ago and went away as bahu. She wanted to win our heart, but we broke her heart. Ishwari asks how to tell her that they are on Sona’s side. Dev says he does not know, Sona has to take her decision herself before it is too late. Next morning, GKB continues busy in arrangements and scolds servants. Vicky asks her to do other work. GKB says she has brought sari and jewelry for bride and shows them. Vicky asks to not show them to him, go and keep an eye on bua/Ishwari, since Asha met her, he feels something is wrong. GKB goes to Ishwari and asks what is she doing here she has to show her bride’s jewelry and sari. Ishwari says if she has chosen, then it is good. GKB says sometimes they seek something and god fails their plan. Even Dev wants to get engaged, so she should not get worried. Ishwari reminisces Soha’s words that papa is doing all this to make mamma realize how much she loves papa. Precap: Ishwari says Sona that she knows how much Dev loves her, if she returns all decisions will be hers. Sona says she is getting late for engagement and asks to go. GKB tells Ishwari when god wants Dev to marry some other girl, then why should they oppose, even it is Dev’s wish. Ishwari reminisces Suhana’s words that papa is doing all this to make mamma realize her love for papa. She says she is right Dev’s wish is her wish. GKB says they should not think much then. They both walk out. Ishwari says she will meet Dev once. GKB asks not to worry, Vicky will bring him. Guests walk in. A guest asks why is Ishwari looking tired. Ishwari says she is unwell and anyways GKB is taking care of guests. GKB gets happy. Ishwari walks in. Girl says she…GKB says she is Dev’s ex-mother-in-law, greets Asha and says even she is included in Dev’s happiness. he is tensed. Dev says no..he is getting engaged. She says she can see he is getting mad waiting for Sona. Dev says no, don’t tell loudly what will Payal think. Elena says Nisha. He asks what.. She says he is marrying Nisha. He says what will Nisha think if she hears this. Elena says he has to accept the fact. Dev says he will not call Sona, let her come when she wants to. Elena says Sona will not come as she cannot see someone else with him, she thought he knows better. He says she will come. Ishwari asks Asha if Sona did not come. Asha says she did not come as she is hurt more than what they are thinking. Ishwari says what they can do to bring her here. GKB on the other side asks Vicky to go and check if Ishwari and Asha are together, their plan will fail else. He asks not to worry. She asks to bring Dev. He says he sent Elena. She says Elena is on bengalan’s side, so he should go and bring Dev. Nisha with parents enter. GKB greets them. They ask where is Ishwari. GKB says jiji must be praying him home temple. Dev comes down with Vicky. GKB continues her drama and makes Dev and Nisha sit next to each other. She asks Jassi maid to bring Ishwari and asks panditji to start pooja. Dev says let maa come. GKB says muhurath will pass on, let Dev come. Pandit asks to give rings. GKB snatches rings from Elena’s hands and gives them to panditji. Jaggi informs Ishwari that everyone is waiting for her downstairs. Ishwari asks Asha to go, she has some work and will come down later. Asha joins Elena. GKB continues her drama and asks Vicky to hold rings till pooja is finished. Golu tells Suhana they should do something to stop engagement. Suhana says that they can do, then says idea…and smiles. GKB insists Dev and Nisha to go aside and chat till muhurath time is reached. Dev says he is fine. She forcefully sends him and Nisha aside. Sona opens door hearing door bell and sees Ishwari. She asks why is she here. Ishwari says where would she go, she thought she would protect her house from harsh sun, but Sona is her shadow. Sona asks why she is crying, come in. Ishwari says when she came to her home as nutritionist and took care of her more than her children calling her aunty ji, but when she became part of her family and called her maa, she did not like it, so Sona had to leave house. Dev and Nisha sit nervously. Nisha says she is nervous as it is her first engagement ,why is he nervous when he already got engaged once.. Dev looks. She says bad job. Dev says it is okay. Nisha asks where is Sona. He says she must be busy in her work, must be coming. She asks he and Sona got divorced 7 years ago, even now there is no misunderstanding between them and they don’t blame each other how. Dev says it is all because of Sonakshi. Ishwari continues that her and Sona’s relationship was more than a doctor and patient. When Sona used to scold her, she used to like it a lot. When she used to scold children, she used to give her bitter guard as punishment and she used to drink it silently as it was given by her sweet friend. Her house is not a house without Sona, she came here to ask something, she not only want her hand for Dev but a companionship for her. Dev continues that he makes mistakes repeatedly, but she corrects him. Nisha says Sona is a good habit in his life then. Dev says habits are habits, but he can say it is good if Sona is around. Nisha asks then why did they get divorce. Dev says it was his mistake. Ishwari apologizes Sona and says she knows she is doing this against Dev’s wish. 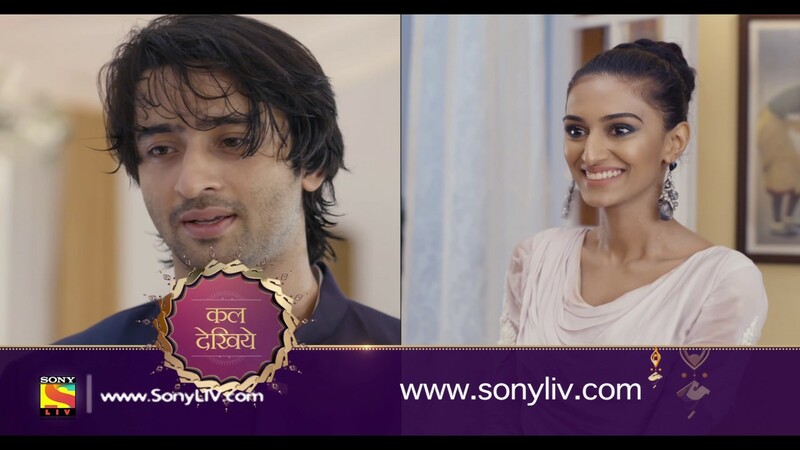 Sona asks what.. Ishwari says Dev wants her to choose him and when she returns, it should be her wish, her conditions and her win as her win is their whole family’s wish. Sona says today is Dev’s engagement. Ishwari says Dev is hurrying to make her realize howmuch she loves Dev. Sona says it is too late. Ishwari says she not only came for Dev, she came for herself and her children’s happiness, please give her one chance. Bejoy watches standing in balcony. Sona says she will get late for engagement and walks in, asking her to go. Iswhari stands disheartened. Sona goes to her room and starts crying. Sona and Ishwari promote Kaun Banega Crorepati on 17th June from 9 p.m.
Precap: Sourav tells Bejoy if he does not tell anything to Sona, she will sit here and cry. Bejoy asks Sona to go, Dev will be waiting for her. Sona reaches Dev’s house. Dev looks at her sitting next to Nisha.